A bishop hat is called a mitre. It is the ceremonial headdress of bishops in the Roman Catholic Church and is used to designate their position within the Church. A bishop hat is a tall folding cap with a front and back rising up to a peak and sewn together at the sides. 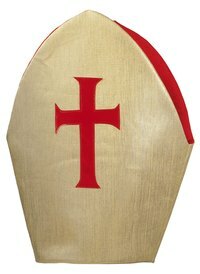 Make a bishop's signature tall tri-cornered hat with paper and wear it to your next costume party or for your bishop Halloween costume. Fold the top edge of the paper down to the bottom edge. Fold down the top right and left corners to the center of the paper so that their edges touch to make a triangle with the paper, 1 inch above the bottom edge of the paper. Fold the top flap of the bottom 1-inch edge of the paper up onto the folded-over-corners edges. Turn the paper over. Fold the right corner in to the center of the paper. Fold the left corner in to the center of the paper to make a house shape. Fold the bottom flap up over the corners to finish making the bishop hat.